Dot-blot analysis of all sorts of methylation peptides using H3K36me1 Polyclonal Antibody. Immunohistochemistry of paraffin-embedded rat brain tissue using H3K36me1 Polyclonal Antibody at dilution of 1:200 (x400 lens). Immunofluorescence analysis of 293T cell using H3K36me1 Polyclonal Antibody. Blue: DAPI for nuclear staining. Chromatin immunoprecipitation analysis extracts of 293 cell line, using MonoMethyl-Histone H3-K36 antibody and rabbit IgG. The amount of immunoprecipitated DNA was checked by quantitative PCR. Histogram was constructed by the ratios of the immunoprecipitated DNA to the input. 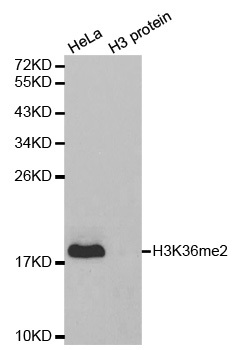 Histone H3K36me1 (H3K36 Monomethyl) Polyclonal Antibody. Unconjugated. Raised in: Rabbit.